Tonight's Wednesday Review is on a short e-book called "How the Beatles went viral in '64" by Steven Greenburg. Today things go "viral" so quickly. Someone posts a funny video clip onto youtube or facebook and overnight everyone is talking about it and the person in the clip is flown out to be a guest on the Ellen show. But things didn't move so quickly in 1963---or did they? From the time the Beatles appeared as an unknown British group briefly on the news with Walter Cronkite to the huge welcome they received at the airport in New York City just 2 months later is pretty amazing. And this book points out that we have one person to thank for this spread of Beatlemania throughout the United States: Marsha Albert, the 15 year old girl that called her local Top 40 radio station in Washington D.C. and asked the disc jockey, Carrol James why the station didn't play music like what she heard on the news. From there James set out to find out who the Beatles were and tracked down a copy of "I wanna hold your hand." The rest is history. I guess until I read this book, I always gave James the credit because he was the one that spread the song around to DJ's around the country; however they are really right---a 15 year old girl really was the one that made the first move. The book also talks about a very controversial subject these days among Beatle fans. Did the Beatles become popular in part because of the depression the country had slipped into after John F. Kennedy's death. Were the Beatles there at the right time to cheer up the citizens of the USA? Many people that I highly admire say that is just a myth and the death of JFK had nothing to do with the Beatles' popularity. However, I think this is a topic that is more complex than just a simple "yes" or "no." For some individual teenagers during that time, the Beatles DID help them get out of the sadness and "dark cloud" brought on after JFK's death. I also thought it was interesting reading about Jack Paar being the first to show a full Beatles performance on American television. However, he showed it because he was sort of making fun of the Beatles--long hair and screaming fans. But it brought him huge ratings and made the Beatles even more popular. This book was well researched and well written. It is a great book for a Beatles "newbie" that wants to learn more about the beginnings of Beatlemania in the United States and how the news of the Beatles spread across the country in the days before the internet or cell phones. However, there wasn't anything new in this book. 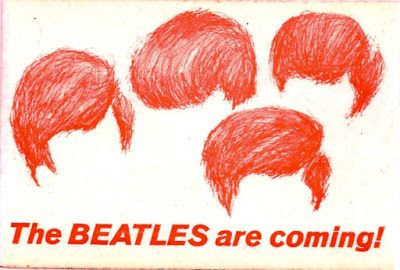 If you want to read the complete story, then I would recommend Bruce Spizer's book The Beatles Are Coming. But this book was good and made for a nice quick read.